I'm in the process of restoring a Sys 11b Mousin Around that has a fried interconnect board. I was able to pick up a new interconnect board at pinfest today that was in an Elvira (also sys 11b). Will this new board work in a Mousin' Around? I'm just now reading that there may be differences in the resistors on each board. There are differences in the resistors. I've also seen some odd things happen even with resistor replacement swapping one from one game to another. Ran into a BK2K with an ES interconnect modified and it was preventing the Flashers from working on C-side. Even replacing the little chip that interfaces with the Aux driver board and relay and double checking everything all the way back. Owner purchased a BK2K interconnect and fixed all the flashers, so I'd try my best to find one for MA if possible. Was afraid of this after doing a little reading tonight. Heading back to pinfest tomorrow and will see if I can talk to the seller. Should have done more homework before grabbing the board today. The only difference I noticed between the 2 boards are the 3 last resistors are different (block resistors on Elvira, little white 'diode-like' resistors on Mousin Around. Hi, this Alan_L, the seller. Two choices: either cut out the block resistors on your board and install jumpers, or return the board for a full refund. All of the boards have a little differences. see Pinwiki fro info. Your either going to have to get from the exact game of swap some parts. That's really awesome of you, Alan. Can I bring the board back to you tomorrow and you can show me which resistors to cut & jump? I noticed a few more resistors have different ohms on them, too. If for some reason this resistor-swap is something I'm not confident doing then a refund is much appreciated. I'd love to get this board you sold me to work in my Mousin Around because it's in amazing shape!!! I just realized that ForceFlow, Pinside moderator and repair guru, is right next to me. I think I can persuade him to reconfigure your board for you. Wish I could help...unfortunately, I'm not familiar with what may be required for modifying an interconnect board for transplanting into another game. It probably comes down to comparing the layouts and schematics of the two boards and identifying what may need to be changed. I just checked the parts catalog, and it was unhelpful in this regard, unfortunately. There was only one generic board layout available. You may need to take a look at the manuals for each game. 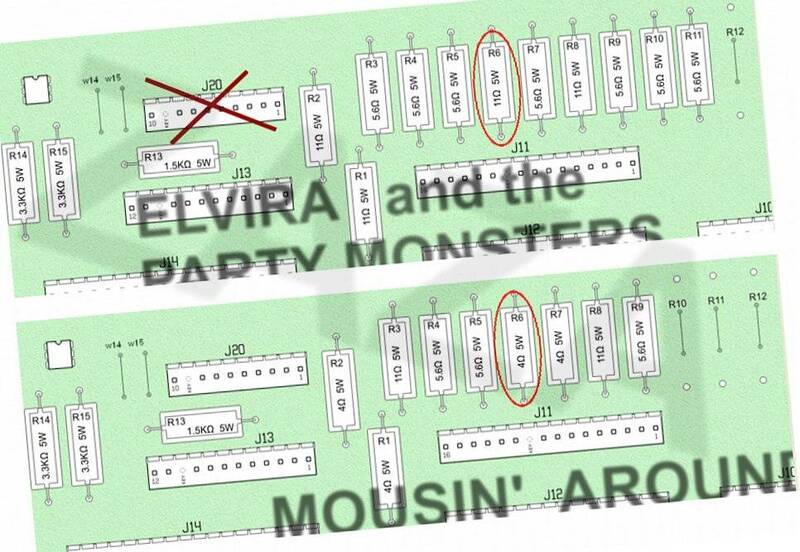 Page 2-9 (mousin') and page 2-10 (elvira) have different values on the resistors. I think it is wise to doublecheck before switching the boards. For example R6 = 11Ohm and 4 Ohm.